“Hug your children. 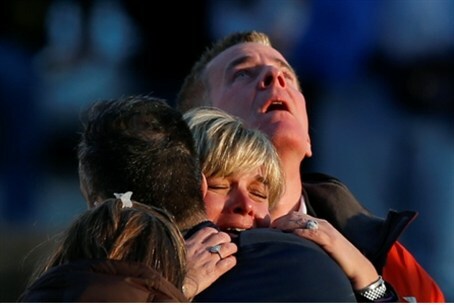 Don’t think life is somewhere over the rainbow,” said the rabbi of parents of massacre victim Noah Posner. “Hug your children. Don’t think life is somewhere over the rainbow,” said the rabbi of the parents of Noah Posner, one of 26 gunned down in Connecticut. Rabbi Shaul Praver of Congregation Adath Israel, told MSNBC that six-year-old Noah "was at the wrong place at the wrong time, and his little body could not endure so many bullets like that." Noah’s mother Veronique, a nurse, fell apart emotionally after hearing the bitter news. The rabbi told worshippers at Sabbath prayer services the following day, “Don’t think that life is somewhere over the rainbow. What you’ve got right now, with your family, your friends, your house: This might be as good as life is ever going to be. Rabbi Praver advised his congregation not to back away from facing reality. “We need to walk back into that school and as soon as the doors open up and go right back to school and continue on with our lives,” he said.